Doc bursts onto the scene in the time travelling DeLorean and exclaims, “Marty … something has to be done about your kids!” …. This perhaps not so famous line was uttered by Doc Emmett Brown (Christopher Lloyd) in Back to the Future Part 2 (BTTF2), about how Marty McFly’s (Michael J. Fox) unborn offspring will be wreaking havoc in the future. Next, we “time travel” to the future with Doc and Marty, where we find a “Baby Boomer-ish” Marty McFly admonishing his irresponsible “Millennial-ish” son, who was about to naively engage in a foolhardy criminal activity. This heated conversation takes place just after Marty himself gets fired for breaking the rules of his corporate employer. The above BTTF2 story seems like a commonly held stereotype myth of the current relationship between Boomers and Millennials (only in the BTTF2 story, we don’t yet know what nicknames to give these future generations). But what’s the real story? Perhaps, we should find out what the different generations really think and dispense with the stereotypical myths. 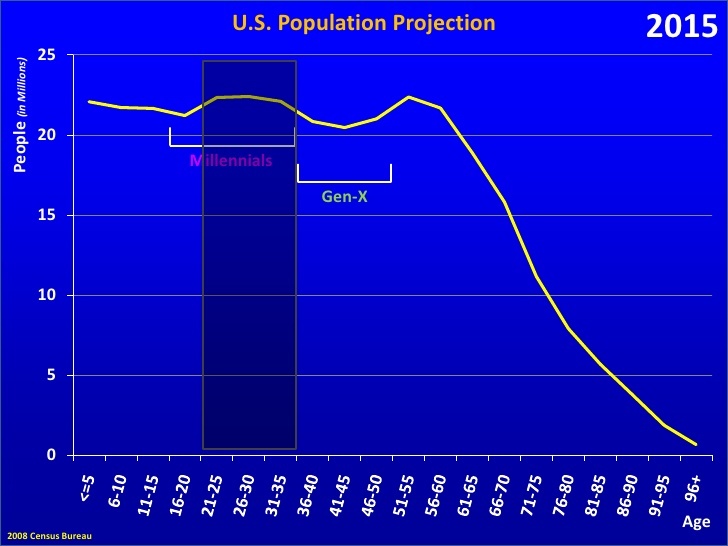 Since they are the largest generational cohort in North America today, let’s start with the millenials. Recently, ArCompany (a full service Marketing Company specializing in Digital and Social Media), through the leadership of Amy McCloskey Tobin (twitter: @amymcctobin) has been exploring the environment of Millennials through The Millennial Think Tank (MTT). MTT is a weekly 60 minute live Google Hangout on Thursday Nights at 8PM EST, where an invited group of Millenials get together to discuss key pertinent topics and offer comment and solutions where possible. Anyone can attend to observe the hangout, moderated by Amy, and offer comments and questions via the chat facility. Amy also produces a recap summary after each weekly MTT event that can be accessed at the Millennial Matters Blog on the ArCompany Website. The Blog also contains a YouTube link for those who wish to see the entire video of the weekly event, after the fact. Although the Millennial Think Tank is a nascent undertaking, it is already gaining traction with a Millennial audience. It’s also drawing interest from other generational groups, other media distributors (such as Steamfeed.com), and from marketers who want to know more about Millennials as an important target market. It seems that Millenials are often portrayed as the “ME” Generation. A cohort of privileged kids, who are growing up with a strong sense of entitlement, and who are fixated on blaming their Boomer parents for creating a world rife with pollution, global warming, extinction of animals, war, global mistrust, triggering terrorism and any number of other heinous crimes. At the recent Millennial Think Tank on the topic of post university debt and its effects on future family life, I found the Millennials to be thoughtful, articulate, industrious, imaginative and predominantly appreciative of their Boomer parents. I am junior member of the Boomer Generation, and the hangout got me to thinking about my earlier years. I remember a great childhood where I got along very well with my parents and they did a lot to assist me in getting my Systems Engineering Degree from the University of Waterloo (an out of town university expense). They also did a lot to get me prepared for later life. But I also remember arguments over music, doing my chores, not having my own car when I turned sixteen, and other “terribly rebellious” scenarios. I couldn’t help but think that in many ways the conversation of both appreciation and angst was really more similar than different with the Millennial youth of today and their parents. Yet I am a Boomer and my parents are from the Greatest Generation. This spurred me on to do some research on the various Generations, their differences, their similarities and their relationships with other Generations. First let’s have a look at what defines the generational groupings, their nicknames, their key issues, and so on. Humour is usually a good place to start, especially if you are poking some fun at yourself while doing it to others. 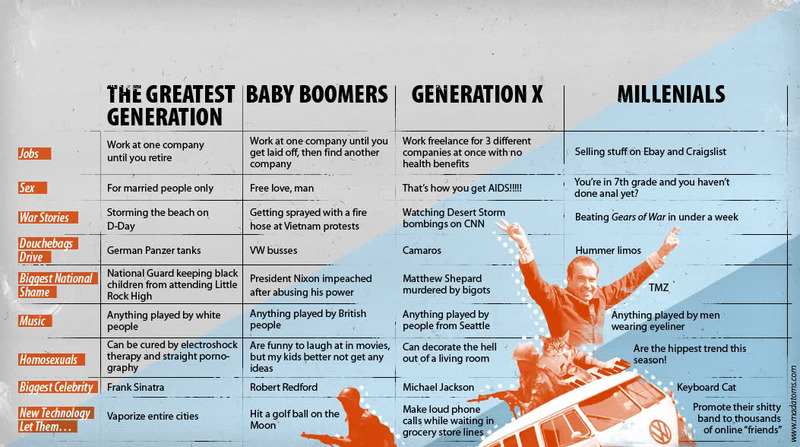 So, as Exhibit A, I offer up Matt Houghtons’ (Primary Writer at MadAtoms) summary on the four most recent generational groups (no slight intended for Generation Z). I especially like the Music category, as I can say that my parents did listen primarily to white musicians and they adored Frank Sinatra. But I am not sure I can truly identify with any music played by men wearing eyeliner, and who the hell is Keyboard Cat (twitter: @thekeyboardcat) anyway? … as a benchmark for contemporary music, Keyboard Cat is just wrong in so many ways …. funny yes, but still wrong! Even though I am a junior Boomer, I cannot identify with working for one company throughout my career. I was heavily influenced by my father, who although being part of the “Greatest Generation”, was a serial entrepreneur for all of his life. At the other end of the spectrum, my daughter who is a Millennial has a full time job with a well known cosmetics firm, where she has applied some of my big company management and customer service advice. Yet that Millennial online entrepreneurial spirit is also hard at work, as she and her fiancé are constantly attending events like The Toronto Comicon (FanExpo) and always buying and selling stuff on Ebay and Craigslist. I would like to think my family’s genetic entrepreneurial history is an influencer, but it is clear that these are also Generational attributes. Clearly, people are shaped by both their individual influences at the micro level and the generational attributes at the macro level. Let’s return to Back To The Future, and engage in a little thought experiment. There is theoretical evidence via Einstein’s Theories of Relativity that it may be possible to travel through time into the future. But it is much less clear as to whether time travel into the past is even a theoretical possibility. For those that are curious, I highly recommend a read (or viewing the Video Documentary) on the physics behind possible time travel at The Fabric of The Cosmos, by Brian Greene. I am sure many will find it fascinating. However, for the purposes of this blog, let’s assume time travel in both directions is possible and easy. I am using this metaphor of time travel because examining why Generations are the way they are is not only a function of the beginning and end dates of the generation, but perhaps more importantly what events occurred throughout the lives of those cohort members as they progressed through time from birth to death. So, its not only what decade in which you were born, but it’s also about the state of the economy, the state of weather and climate, the state of politics and cultures, and the state of technology for those in a common cohort (a generation) as they moved through time. The Back To The Future reference is also interesting because it is the story of a Gen X kid who is a peer friend of a member of the Greatest Generation. Together they travelled into the world of Millennials, and Moderns and then back into past generations as well. If this isn’t confusing, I don’t know what is. 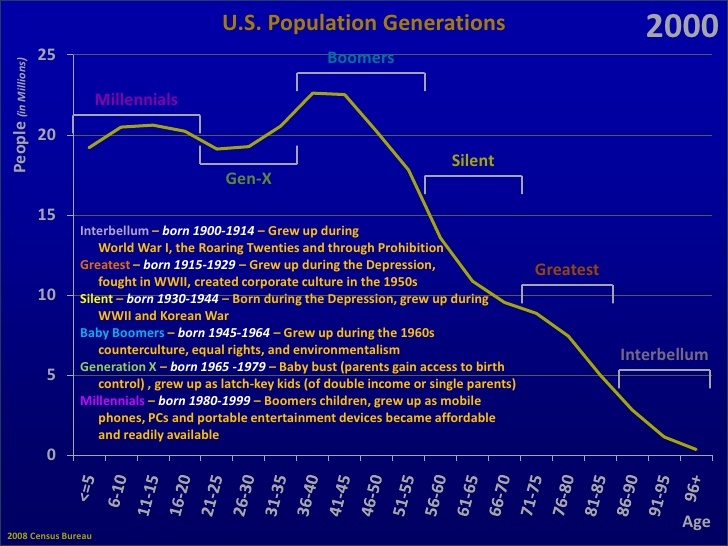 Although there is not a rigidly accepted definition of the various generations, I found the following presentation charts from Mark Crossler (twitter: @mcrossler) at Oregon State University (based on US Census Data) to be useful for generation names, birthdates and sizes (see the year 2000 slide below for these definitions). It is also important to note that the various generations (e.g. Boomers, GenX, Millenials, etc.) are not all the same size in number of years; some are 15 years, others are 20 years in duration. So because of the inconsistent durations, size of a generation as a percentage of the total population can be somewhat misleading. The presentation was also helpful to understand the actual size for each year within the generations and the macro size changes from year 2000 projected out to 2030. 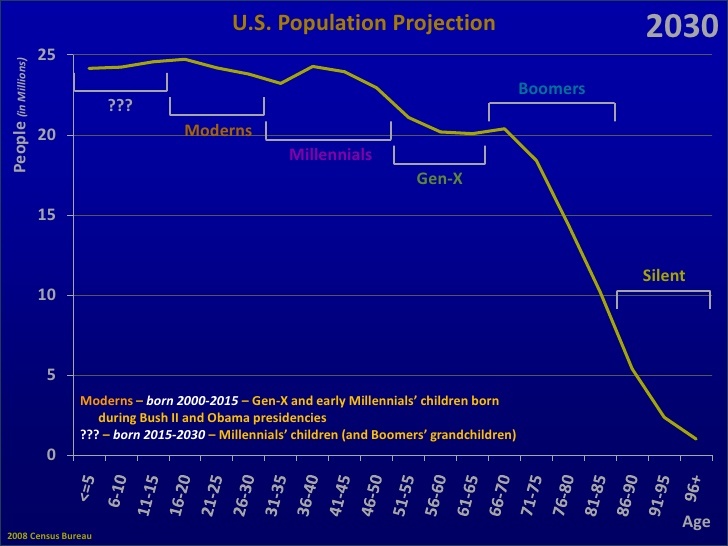 I picked out a few slides that illustrate the projected generational demographics. 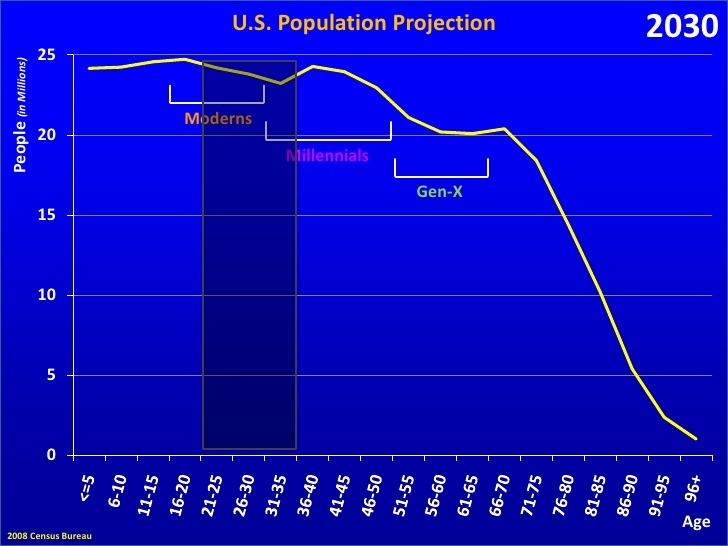 You will see from the year 2000 slide, the Boomers represented the largest cohort by a significant margin, but by 2030 Millenials and Moderns (Generation Z), and the as yet unnamed cohort after Gen Z are expected to grow rapidly in size and percentage, exceeding even the earlier boomer size peaks. Getting back into our time-travelling DeLorean, and going back to year 2000, we see another interesting aspect of the generational changes across time between 2000 and 2030. The darker vertical bar in the following three slides from Mark Crossler’s presentation, represents the time when a generation is passing through the all important formative ages of 20 – 35. This age period of 20 – 35 is critically important as the time when transition from young adulthood to starting families and putting down roots largely occurs. 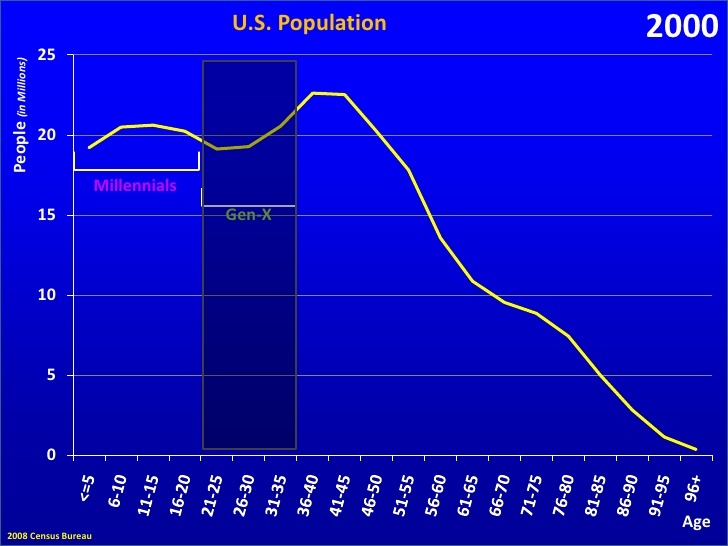 Although it is too long of an analysis for this blog, when you map this young adulthood transition to macro-economic performance, most notably the crash of 2008 – 2009 and the following 3 – 4 years of slow economic growth, you will see that the Millennial generation was moving through it’s 20 – 35 age period at almost exactly this time. Perhaps this explains the key issues of not owning their own homes, living longer with parents and experiencing high educational debts. Again, I invite you to attend the ArCompany Millennial Think Tank to garner more incites directly from the Millennial cohort themselves. As much as we would like to accurately predict the economy in the future, it is an extremely difficult task, and we haven’t yet perfected our “time travelling Delorean”. 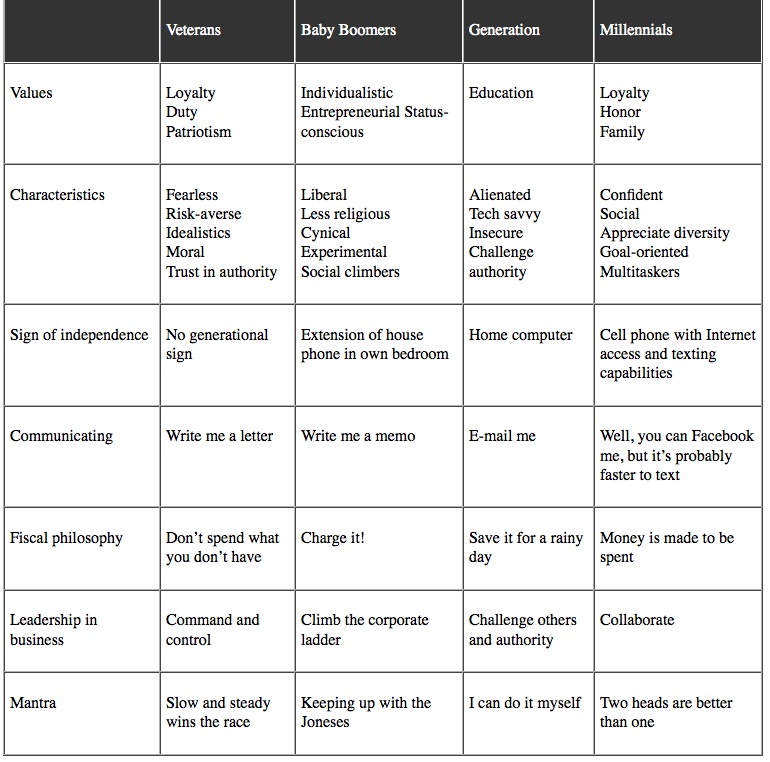 It is only logical, however, to think that as the Millenials transition power to the Moderns (Gen Z) and the following as yet unnamed generations, the size of these generations and how the economy and environment are managed will impact job availability and dramatically shape their behaviour and attitudes. If you are more interested in a brief synopsis of the historical events of the Generations, and their sub-generation nicknames, I recommend a read of Isacosta’s site: List of Generations. 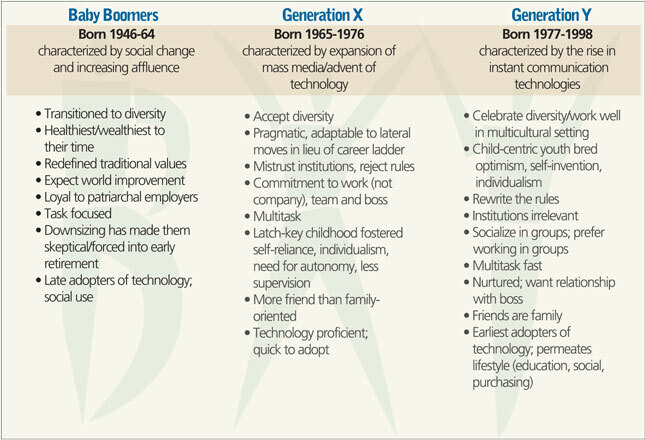 Before we conclude this blog, it is important to provide some summary of the attributes of the various generations. There are countless pieces of research in this area and many are focused just on work habits and ethics. Although a drill down examination of the workplace is useful, I think it is more important to take a broader view to understand how the generations are different or similar, and to ultimately consider the possible impact or “so what” of these conclusions. This is what ArCompany is examining through the The Millennial Think Tank (MTT) and other Generational initiatives to come. 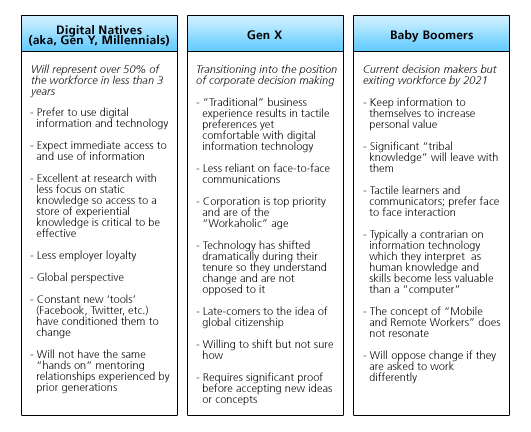 Although these are not the flashiest of charts, the following are three of my favourite summary charts (based on their content) to define the broader attributes of the Generations. Stay tuned for further insights from ArCompany. I especially like the Mantra for the Boomers of “keeping up with the Joneses” … after all, that’s what it is about, isn’t it. The state of the economy has a huge influence on the views of the generation cohort, particularly when they are at the formative age range of 20 – 35. In addition to the macro-events that impacted a Generation while they travelled across time, we should also appreciate that the micro influences from family (particularly parents) and friends can be as or even more significant. This is why certain Boomers think like Millennials and visa versa in certain aspects of their lives (e.g. Entrepreneurialism). Communications technology (the “hardware”) and access to “online communities” via Social Media (the “software”) has had a profound effect on the structure and linkages of the “family” across Generations, whether the conventional patriarchal family or the family of friends / community. More recently this ease of communications has also enabled both of these “families” to thrive over great geographies. Yes, there are key differences (e.g. language, methods of interaction, how we work, music, community relationships and so on) between the Generations that must be considered when engaging with each cohort. But when it comes to values and culture (e.g. the importance of our children, etc. ), I think we are more similar than different. There was a famous saying from the movie “Cool Hand Luke” uttered by the Prison Warden “Captain” (played by Strother Martin) to war hero turned inmate; Luke Jackson (played by Paul Newman): “What we have here is a failure, a failure to communicate.” Let’s not allow these words to get in our way when building connections between the Generations. As ArCompany intends through The Millennial Think Tank (MTT), let the dialog continue. Join us at MTT! Hey Bob – really agree w/some of the insights in this post, especially on how generations are more similar than the general trends might make it seem. One illustration of this is that while Millennials don’t really look at home ownership as a priority (the economy has a lot to do with it) we still care about many of the embedded values that Gen X or Boomers sought in it, particularly the opportunity to build one’s own life and passions. On the Steamfeed podcast yesterday all 4 of the Millennials (including myself) summed up our most important personal value as the ability to build things we are deeply passionate about, with people we care about. In some ways the bent economy is an advantage in that it has us helping shift values that were always there, just not necessarily in the workplace… I’m extremely appreciative of the ideas and support I get from folks in my generation who say, yeah, why not do what you love, what’s the difference when you are nearly starting from scratch? And that has helped me to connect to Gen X, and many Boomers, too. Joe – thanks for the good words on the post and for sharing some of your insights … always welcome. I think what I found in some of my research is that the Generations do share similar core values (like supporting our kids, doing things we love, doing the right thing, supporting good causes, freedom, etc. ), but because of our different circumstances, finances and technologies, we seemed to find different methods of getting to those core values. Your house example is a good one … there are multiple ways to create a secure and comfortable environment for our families. Regarding loving what you do, I have been lucky even in my years of experience in big Telecoms. I have enjoyed pretty much all of the jobs I have had, and one way to do this and also be entrepreneurial in a large company is to continually invent new jobs / opportunities. Perhaps Boomers in general were less comfortable “colouring outside the lines” of the standard company position description or opportunity, but I usually found that it was possible … one just has to stand up and be counted … demonstrate some leadership … a key ingredient of successful entrepreneurs in any Generation. I enjoyed the Millennial Think Tank team’s discussion tonight on Entrepreneurship … Like you, I have also thought that Marc Andreessen is a pretty cool guy. Continue to do good work in your endeavours and on The Millennial Think Tank. Maybe we will have an opportunity to collaborate on a blog or on some business in the future. I am available to assist if you want it … just ask. BobJonesArC JoeCardillo Thanks! Very much appreciate the offer, Hessie and Amy have both spoken highly of you so I’m sure at some point in the near future we’ll get a chance to hang out and/or work on something.